Looking for something a little bit off kilter? Enjoy drinking limited edition beers that may not be there tomorrow? 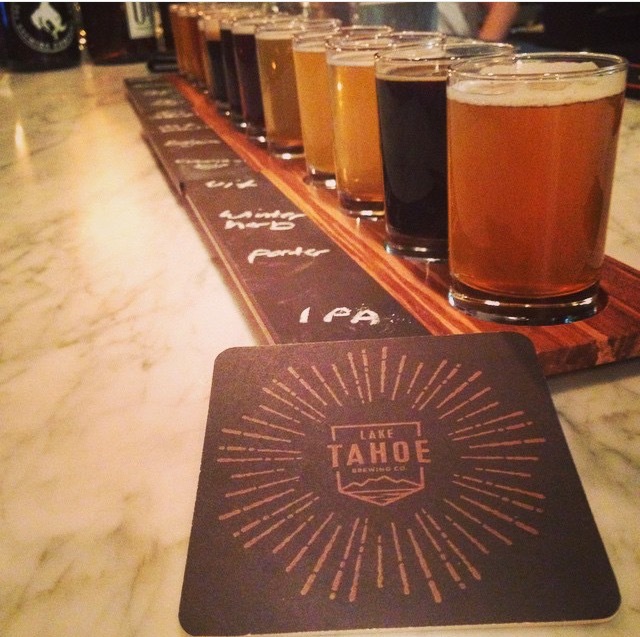 If the answer is yes to these questions then Lake Tahoe Brewing might be a go-to spot. In what was originally the High Sierra Brewing’s location in downtown Carson City this micro-brewery makes small batches of distinctive craft beer. From one day to the next the beers on tap change so quickly you will never be bored on the selection to choose from. Along with the beer selection, the food is on point as well. From wood fired pizzas made to order, to house fired meats like the pastrami on their Reuben Sandwich, or a beer brined chicken there is something for everyone. If you are staying on the north side of the lake and Carson City is just too far, don’t worry they are opening a new location right in downtown Truckee. 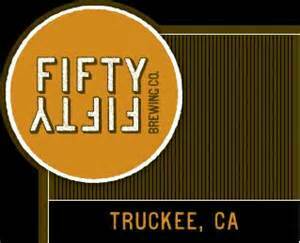 It seems that every town around Tahoe has really picked up on the “craft beer craze” and now Incline Village has officially joined the party in a big way. With a rustic but sophisticated style Alibi fits well into the culture of this small slice of heaven on the North Shore of Tahoe. From the recycled pallets, the solid beamed bar, to the old beer can collection Alibi immediately kick starts your senses. Seconds after your nose takes over. The open design allows you to watch and smell the brewing process throughout the different stages. This brewery and public house have been cleverly designed with a mix stimulating your sight, smell and taste to provide the complete journey. The look and smell is awesome, but make no mistake…the taste of the beer is definitely the main attraction. From the standard IPA the flavors run the gamut. Some include Kombucha, Porter, Stout and even a nice Strawberry Tart. Catering to all taste buds their large assortment of beers from European to hoppy American styles make this a perfect place to hang out with friends and to meet the locals. Although there is no kitchen, food is never an issue. Sol Food Food Truck is usually parked nearby or you can even bring your own! After a day of romping around the hills or swimming in the Lake, swing by and grab a cold one. This spot will be one of your new favorites! When Cold Water Brewery just opened their rotation of eight brews were great, but like all great places they did not rest on their laurels. It seems that this pub continues to evolve from their food selection to their beers. One of their newest selections is considered a Golden Ale based on how it is brewed, but it deserves its own category. Starting sweet like Saison it finishes dry like a true golden ale. A perfect fit for a Saison lover that wants to expand their palette a bit, or for anyone wanting something a little out of the ordinary. Debbie is a very hospitable owner that listens to her patrons. The menu and flavors are continually being tweaked to perfection. If you’ve been, I know what you are thinking but don’t worry. The greatest dessert ever is still on the menu and unchanged…the Gigi. 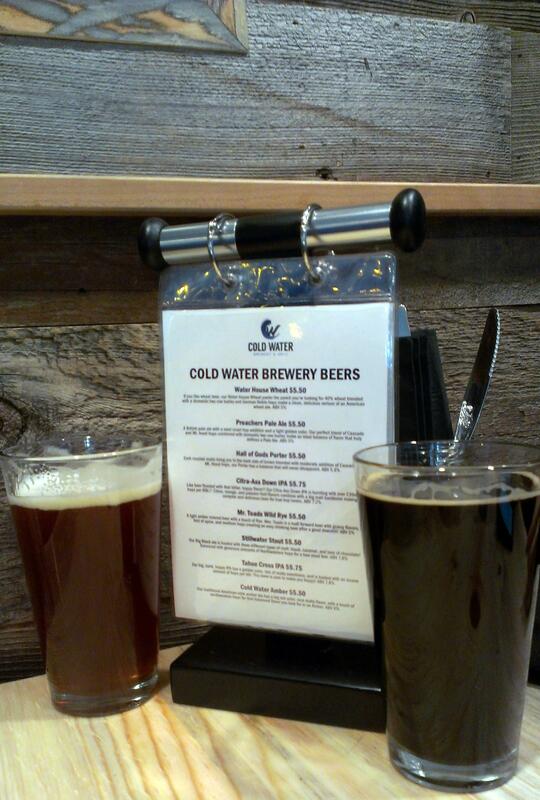 For more about the Gigi and the Coldwater Brewery, go here. The classic skate/snowboard trick the “50-50” is a slide or grind down a rail parallel to it while keeping yourself balanced. Just like this, Fifty-Fifty Craft Brewery and Restaurant leaves you with that perfect balance. Great beer along with tasty food to finish off the day. Names like Concentrated Evil, Rockslide, and Foggy Goggle let you know this spot understands how to have fun. Even if you’re not a drinker, the cuisine is worth a stop. From pizzas, to salads, and sandwiches there is something for everyone. If you are looking for something unique, try one of Mountain Valley Meats sausages. Thes are freshly made next door at the butcher shop. As you can see, no matter where your expedition leads you in the region there is a brewery nearby. Instead of the run of the mill lager or typical brand sold everywhere, why not try some of the local flavor. You could find a new favorite! Did you miss Part I of Local Freshies “Brew Review?” Check it out here.